Show your never ending support for RA while wearing this eye-catching support RA Awareness T-shirt. This great design helps bring this cause to the surface so those with little knowledge of this condition will understand how important spreading awareness is. 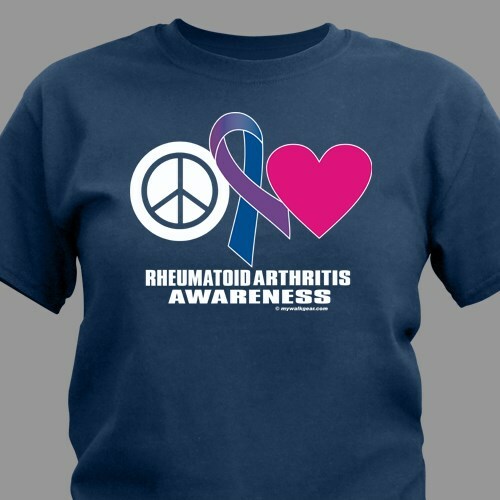 This Peace Hope Love Rheumatoid Arthritis Awareness T-Shirt is available on our premium 100% cotton T-Shirts, machine washable in youth sizes XS-L and adult sizes S-3XL. I really like the implication of this shirt "Peace, love, and hope". The shirt is good quality and the shipping time was terrific. The sizes are true to size. Additional Info MyWalkGear.com is dedicated to promoting Awareness for the Arthritis disease, supporting those battling and encouraging others to get involved in the fight for a cure with unique Arthritis Awareness Apparel and Walk Gear. Help us help those who need us the most with this inspiring Awareness T-Shirt or our Personalized Walk For Rheumatoid Arthritis Awareness T-Shirt and our Athletic Dept. Arthritis Awareness T-Shirt.You will feel great knowing every purchase made MyWalkGear.com will donate a portion of the proceeds to end this disease once and for all.